Taste of Northfield, a summertime tradition in Downtown Northfield for many years will be reborn this coming June 15. 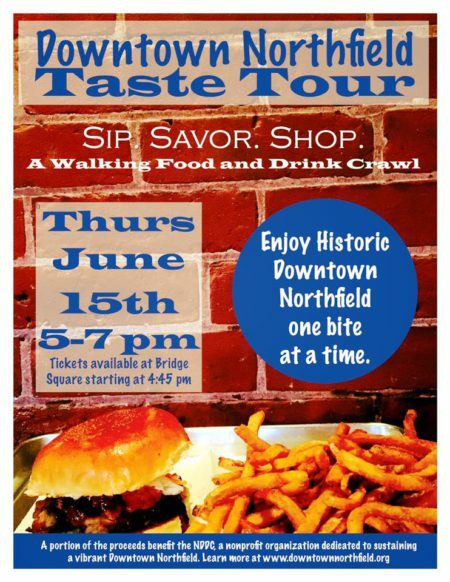 Renamed “Downtown Northfield Taste Tour”, the event will be held from 5-7pm in a number of eateries and watering holes. Taste Tour is a walking food and drink crawl from one end of Division/Water Streets to the other. Tickets will be available at Bridge Square beginning at 4:45pm. A list of participating restaurants will be published soon. Added bonus: Northfield Community Band concert in Bridge Square at 7pm! Sip. Savor. Shop. See you on June 15th!